Music Education is an ideal career if you have a love of music, a passion for teaching, and a desire to shape and guide young musicians. The Music Education program at SRU will prepare you to teach instrumental, vocal, and general music to students in grades K-12. Successful completion of this program will prepare you to obtain your Pennsylvania State Teacher Certification. A career as a music teacher gives you the opportunity to pursue your passion and share it with others. In the Music Education program at SRU, you'll enjoy dedicated, individual instruction and mentorship from our highly skilled faculty in a hands-on learning environment. You'll participate in at least 190 hours of real-world experiences through observation, exploration, and teaching in K-12 schools, culminating in 16 weeks of student teaching supervised by a faculty member certified in music education. The Music Education program also offers opportunities to develop not only your teaching skills, but also your own professional musicianship. You'll be a performer in large and small ensembles, take lessons on your chosen major instrument, and be able to explore solo and ensemble performance opportunities on and off campus. 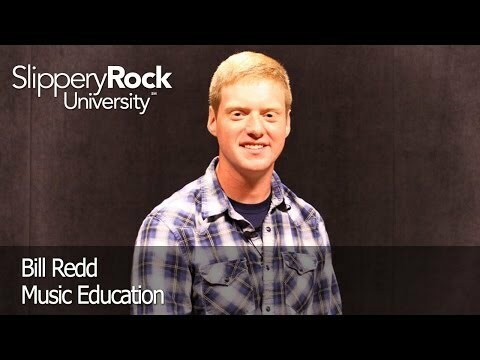 Bill Redd is a 2014 graduate of the music education program at Slippery Rock University. He talks about how his major is more of a family atmosphere and how he has received great networking experiences. He has been able to do over 300 hours of field work within his major. Bill is involved in several organizations around campus such as the SRU Marching Band and the Student Government. He has been able to travel to Italy to study culture and history. Minor in Exceptionalities: The Minor in Exceptionalities will provide music education majors with additional studies and experiences designed to prepare for teaching all learners. Music Performance: The degree in music performance focuses most directly on developing performance skills, which could be used in a private teaching setting, or lead to graduate studies or a performing career. Music Therapy: In music education, the focus is on teaching students skills in music. In music therapy, music skills are also used to address other skills, such as speech, motor, cognition, social, and other non-musical goals. Letter of Completion in Teaching Music Online: The LOC in Teaching Music Online will prepare music educators to teach music performance and general music through online learning.